We are now within a month of the General Elections on Tuesday, November 6—with early voting starting on October 22! As we near the last few days of voter registration, we are in full throttle and continuing to inform voters about the Constitutional and Charter Amendments, as well as referendums on the ballot. Due to the length of this year's ballot we highly recommend for voters to vote by mail or go to an early voting site. LWVMD is joining the Miami-Dade Elections Department in encouraging voters to "Be Election Ready." This year's ballot will include local, state and federal races as well as a minimum of 17 questions, depending on where you live—people in several municipalities will face even more. Feeling overwhelmed? Don't be! 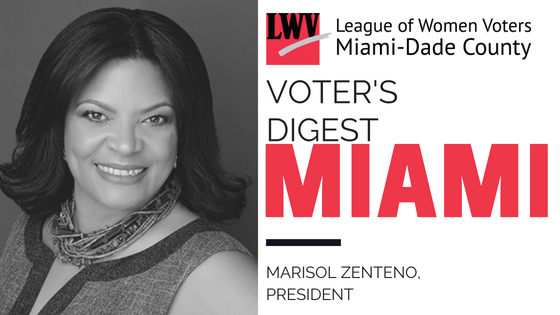 Between our voter guides at Vote411 and our Decode Your Ballot program designed to help voters understand the all the Florida Constitution and Miami-Dade County charter amendments, the LWVMD has got you covered!. Come to one of our presentations (check out our Events Page for more information) or our YouTube channel or LWVFL for a breakdown of the Constitutional Amendments. If your organization would like to schedule a presentation, please email Rachel Federgreen at rachel.federgreen@gmail.com. Rember change starts with YOU. If you have friends, neighbors, or loved ones who do not always vote, create your own active voting network! Send our information about voting, including our online Voter’s Toolkit, to your contacts—and encourage them to pass it on! LWVMD is a member of the Florida Election Protection Coalition, a group of civic organizations which seek to monitor and report any issues voters may have at the polls during voting. 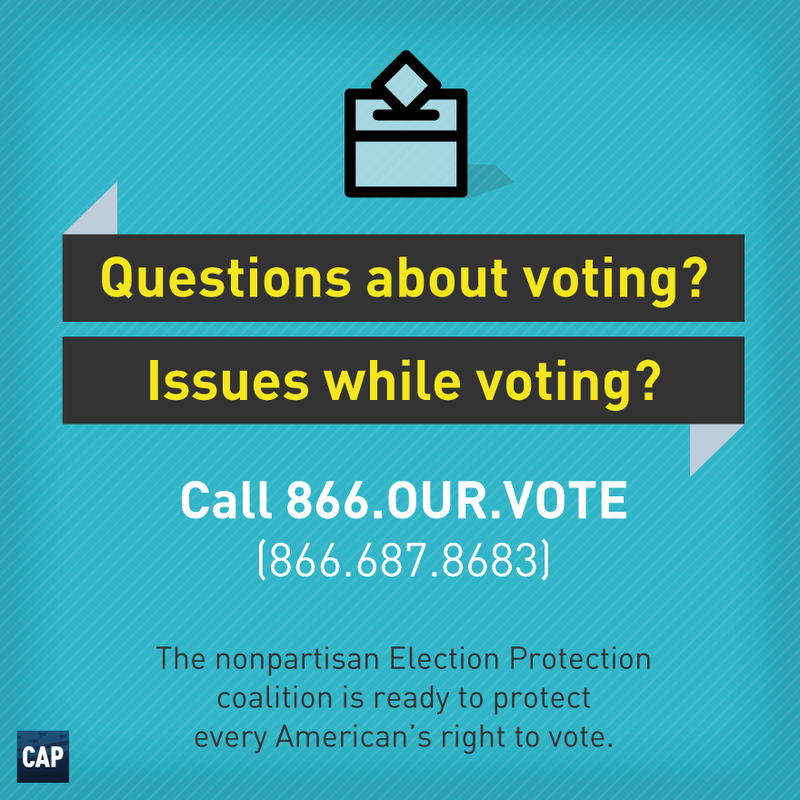 If you have any issues at the polls or hear of any problems please contact the Poll Protection Help Center at 1-866-OUR-VOTE or Rachel.Federgreen@gmail.com. GET YOUR PARTY ON...AT THE POLLS! LWVMD is proud to announce we're hosting three Parties at the Polls for this election! Join us on October 27 in Homestead, MDC - North Campus on October 29, and in Little Haiti and Overtown on Election Day as we offer the community at large food, fun, and games at/or near polling locations during Early Voting and on Election Day. We can’t do this without you! We need all hands on deck to secure donations and help with community outreach and support day-of logistics. If you would like to join the committee or volunteer on the day of any of these events, please email Krystina Francois at Krystina.francois@gmail.com. Historically voters between the ages of 18 and 30 usually have the lowest voter turnout of any age group, but we're working hard to flip that this election season! LWVMD along with our partners and passionate student activists successfully called on the Supervisor of Elections and Mayor Gimenez to provide early voting sites at college campuses in Miami-Dade. As a result, Florida International University and Miami-Dade College’s North and Kendall campuses will now have early voting sites for the general election. Our Student Fellows have been a force to be reckoned with, registering voters, presenting our Decode the Ballot program at local colleges and are playing a major role in our #VoteTogether Parties At the Polls. If you are or know of a student who is interested in making democracy work in this election season and beyond, please refer them to Morgan Anderson, our Chair of Student Engagement and Campus Partnerships, at morgan@teamjargon.com. LWVMD joins city officials and elected leaders in urging voters to vote yes on Referendum #362, Secure Our Future, which will benefit teachers and students. The referendum would raise property taxes to bring in an additional $232 million each year for public education in Miami-Dade County. About 80 to 90 percent of the funds will go directly toward increasing teacher pay, with the remainder spent on the placement of certified law enforcement officers at all public schools for enhanced security. At less than 40 cents per day for the average taxpayer, this initiative will increase teachers’ pay in Miami-Dade and is a priceless investment in our students, teachers, and community. Red Tide has migrated to Florida's East Coast shutting down beaches from Miami-Dade to Palm Beach County. On September 27, County Commissioners voted 9-4 to approve the Comprehensive Development Master Plan to push the SR 836 Expansion plan forward. LWVMD strongly opposes this roadway, which crosses the Urban Development Boundary, jeopardizing the Everglades ecosystem and the freshwater it supplies to residents of Miami-Dade County. So what can you do? 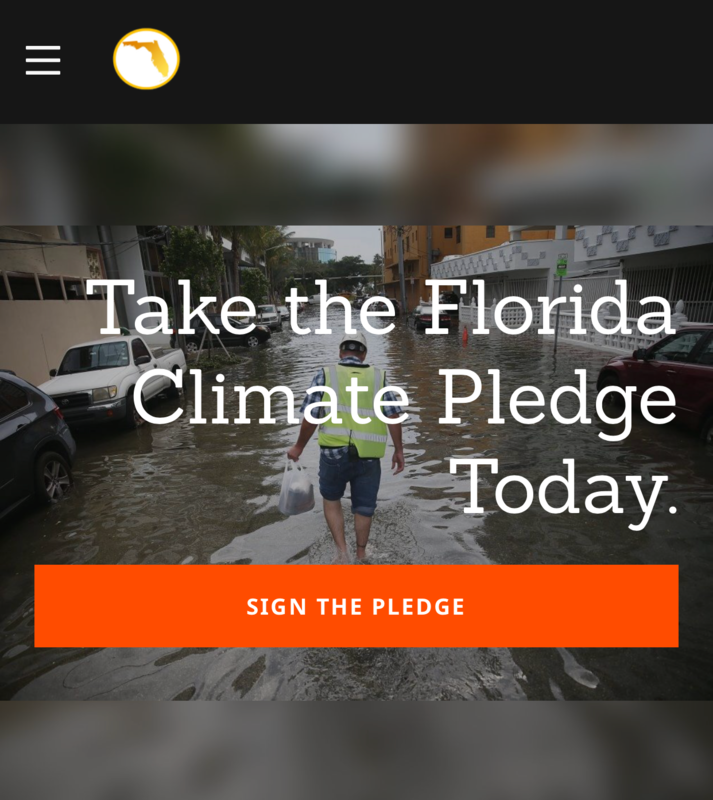 Take the Florida Climate Pledge today and become a Climate Conscious Voter on November 6! LWVMD President Emeritus Susan Windmiller will be honored for her leadership in climate action at the 2018 CLEO Institute Annual Celebration on October 23. Help us celebrate this achivement which will be held at The Sacred Space Miami. Click here for tickets. There are still many ways to make a difference in engaging voters in these important elections. The deadline to register voters to vote is Tuesday, October 9. If you are interested in registering voters with the League, please contact: volunteerslwvmd@gmail.com.If you are comfortable with public speaking and would like to volunteer to present the ballot amendments, please email: Rachel.Federgreen@gmail.com. This is the time to rally your family, friends and your networks to get out the vote! This is the time to let your voices be heard in the best way possible and decide the future of the community for years to come. There is just too much at stake—everyone’s voice needs to be heard. We need your help during this final push. Even a few hours will be extremely helpful—so we would love to hear from you! We have many opportunities for you to be involved. Help us with any of the events below, like and share our information on social media, and refer your friends to our events. 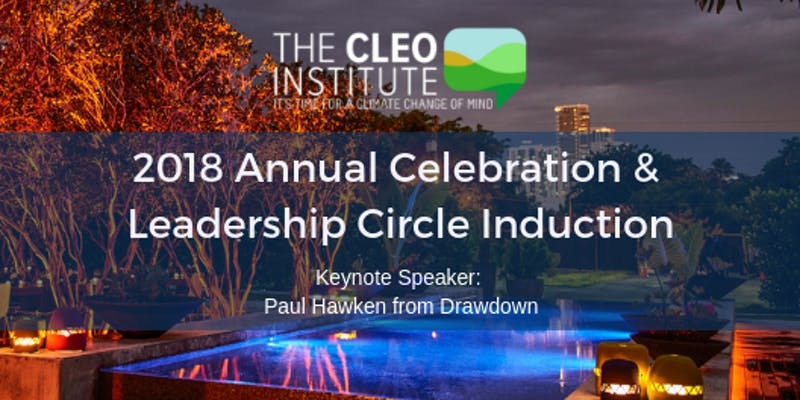 Tuesday, October 23, 6:30 – 9 p.m.: CLEO Institute 2018 Annual Celebration and Leadership Circle Induction. The CLEO Institute highlights the urgency of climate action and impact policy, championing solutions for a resilient future. This year’s keynote speaker will be Paul Hawken, one of the environmental movement’s leading voices. The Sacred Space Miami, 105 N.E. 24th Street, Miami, FL 33137. Click here for more information and tickets. Saturday and Sunday, October 6 and 7: See solar in action this weekend! More than 700 solar homes and businesses across 48 states are hosting open houses this weekend for the National Solar Tour, the county’s largest-ever, grassroots solar open house. 12 homes are in Miami-Dade! Visit the online map and RSVP for free tours. Tuesday, October 9, 2018, 7 p.m.: Decode the Ballot Presentation. Immigrant Resource Center. 1631 SW 107 Avenue, 2nd Floor, Miami, FL. Tuesday, October 9, 2018, 4:30 p.m.: Miami UTD Solar Co-op Information Session. Find out how to shrink your energy costs and your carbon footprint! Coral Reef Library, 9211 Coral Reef Drive, Miami, FL 33157. Sessions will also be held on November 10 in Miami Beach and December 1 in Little Haiti. Click here for more information. Thursday, October 11, 2018, 9:30 a.m. – 3:30 p.m.: Decode the Ballot presentation at 11 a.m., plus Voter Registration. FIU Biscayne Bay campus, 3000 N.E. 151st St, Miami, FL 33181. Saturday, October 13, 2018, 10 a.m. – 1 p.m.: Decode the Ballot presentation for LWVMD membership. Center for Social Change, 5th Floor; 2103 Coral Way, Miami, FL. Sunday, October 14, 2018, 2 – 4 p.m.: Women's March Miami. IUOE (International Union of Operating Engineers) Local 487, 1425 N.W. 36th St, Miami, FL 33142. Monday, October 15, 2018, 6 p.m.: Decode the Ballot presentation with Catalyst Miami. The Tribe, 937 N.W. 3rd Avenue, Miami, FL 33136. Thursday, October 18, 2018, 6 p.m.: Decode the Ballot Presentation at JCS of South Florida – Lambda, 735 N.E. 125th Street, Miami, FL. Thursday, October 18, 2018, 12:30 – 2 p.m.: Decode the Ballot Presentation at Barry University, 11300 N.E. 2nd Avenue, Miami, FL. Thursday, October 18, 2018, 6:30 – 8:30 p.m.: Cocktails and Conversation in Kendall. Join the LWVMD for a relaxed evening of conversation about current events and activities nourished by happy hour nibbles. Devon Steak House, 11735 Sherry Lane, Kendall, FL 33183. Monday, October 22, 2018 to Sunday, November 4, 2018, 7 a.m. – 7 p.m.: EARLY VOTING find your closest polling station here. Tuesday, October 23, 2018, 3 p.m.: Decode the Ballot Presentation. MDC Wolfson, 300 N.E. 2nd Avenue, Miami, FL. Tuesday, October 23, 2018, 7 to 9 p.m.: You Be the Judge: Why the Courts Matter: A Free Interactive Experience, sponsored by NCJW Miami and numerous community partners including LWVMD. Temple Israel of Greater Miami, 137 N.E. 19th Street, Miami, FL. Free; free parking and light refreshments. RSVP to NCJWMiami.org/judges. Wednesday, October 24, 2018, 7 p.m.: Decode the Ballot presentation coordinated by the National Council of Jewish Women, Kendall. Temple Beth Am, 5850 S.W. 88th Street, Pinecrest, FL 33156. Friday, October 26, 2018: Rally to the Polls at MDC Wolfson Campus, 300 N.E. 2nd Avenue, Miami, FL 33132. Saturday, October 27, 2018: Party to the Polls in Homestead. Email Krystina Francois at krystina.francois@gmail.com for details about attending or helping out! Monday, October 29, 2018: Decode the Ballot at Miami-Dade College North Campus, 11380 NW 27th Ave, Miami, FL 33167. Time TBD; please email rachel.federgreen@gmail.com. Tuesday, November 6, 12 - 3 p.m.: Party to the Polls in Little Haiti and in Overtown. Email Krystina Francois at krystina.francois@gmail.com for details about attending or helping out!